We use the term “starving artist” as a playful descriptor for the career, a cheeky marketing ploy for arts events, and even in catchy brand names for arts related businesses. Its influences are so ubiquitous that we often fail to see the phrase for exactly what it is, a harmful title that doesn’t actually jive with how we see creativity in today’s world. In this article, I will make the case that this little idea is at best a self-fulfilling goal, and at worse one of the most damaging outdated paradoxes one can wear as an artist. Read on for more. “Starving artist” conjures up images of a befuddled artist, usually with a nasty paint brush, tattered clothes, and perpetually unable to secure the most basic of living conditions. In other words: an unemployable, destitute, failing waste of a pointless career. 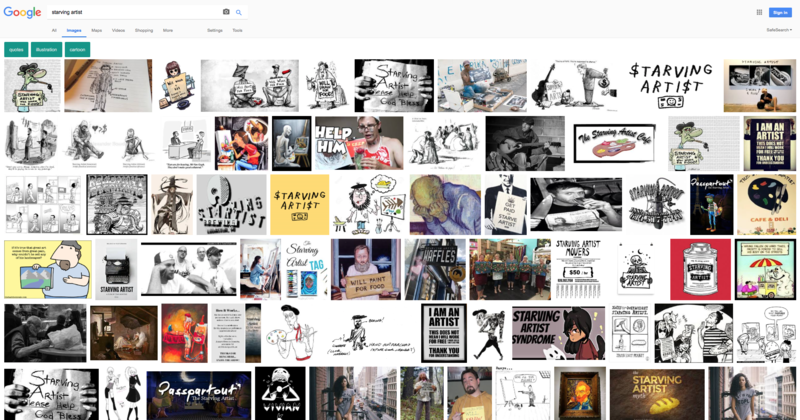 If this seems overly dramatic, let’s go to Google image to see what billions of people might see when they type in “starving artist”. The results point to a particularly negative perception of not just the career, but more importantly the person behind the career. The artist is almost exclusively portrayed as unemployed and if not virtually homeless… certainly hopeless. The images show artists as charity rather than as an industry. Click on the image below. Zoom in. Really investigate it. This may describe you as an artist to the T, it might not. But there’s a fundamental problem with the cyclical nature of such a perception. Lets look at the role of the art career in direct relationship to money. How can anyone possibly expect to be considered a viable option in the world if the lens from which they are reviewed is nothing shy of a second class citizen?Additionally, something quite remarkable happens when you do the same test and simply remove the word “starving”. 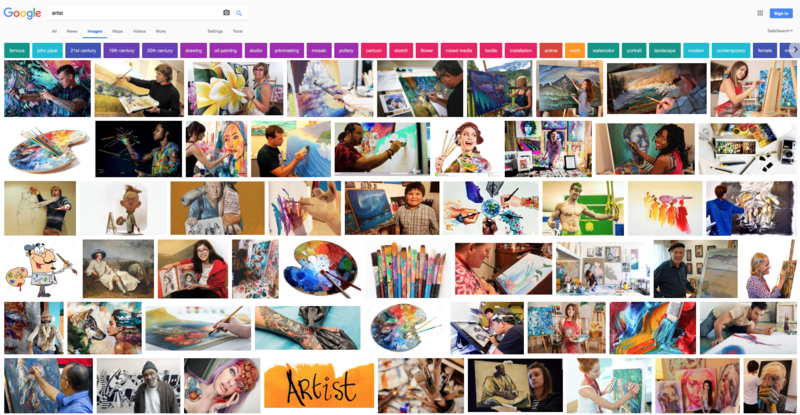 Googling “artist” will result in a series of bold, colorful, smiling, happy people, successful in almost every photo. Sure, this still smacks of stereotypes and most photos are tremendously amateur looking, but there’s no denying that the overwhelming theme is positivity rather than squalor. 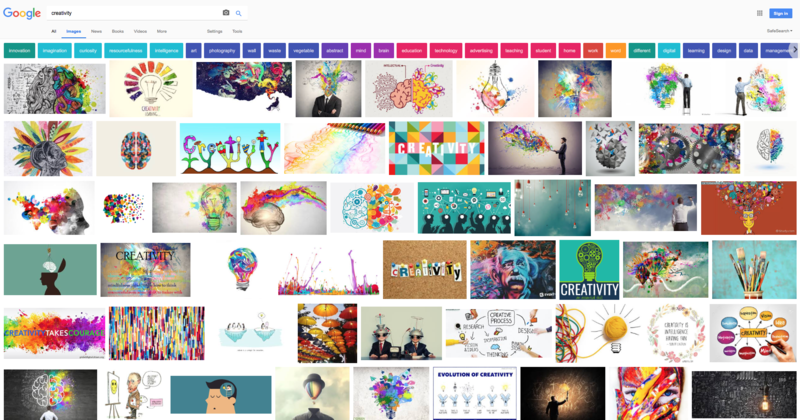 Even more interesting, Google the word “creativity”. Once more, the full rainbow of colors are dominant. Positivity is also thematically there, but there’s more. Click on the image and zoom in. Pay special attention to the suggested related topics above the images. The largest search engine in the world has photos and related topics such as “innovation, imagination, curiosity, resourcefulness, intelligence, mind, abstract, brain, and teaching”. These aren’t descriptors of a deadbeat. No, there’s a clear a proposition that creativity is one of the most cherished parts of the human experience. There’s even a drawing of Albert Einstein himself! Again, these are still stereotypes, but our popular culture is describing the same topics with directly oppositional results. While this is simply an exercise in popular culture, the same type of results happen across cultural boundaries. Why? What is happening? Some cite that the starving artist trope was first widely romanticized by Henri Murger’s 1847 collection of short stories called, Scènes de la vie de bohème. Reflecting the concepts of Paris in that era, Murger fawned about the struggles and freedoms of a penniless existence through his characters. In 1895 Giacomo Puccini was inspired by Murger’s writing and adapted it into La Bohème, one of the most popular operas of all time. This only helped further secure the romance behind creative poverty into the public domain. You can see such an influence playing out in the beatnik, hippy, and hipster eras. For the most part, we still use creative poverty as our model for artistic freedom today. But I live this as a small business owner in the day of shared workspaces and flexible self-propelling entrepreneurship. 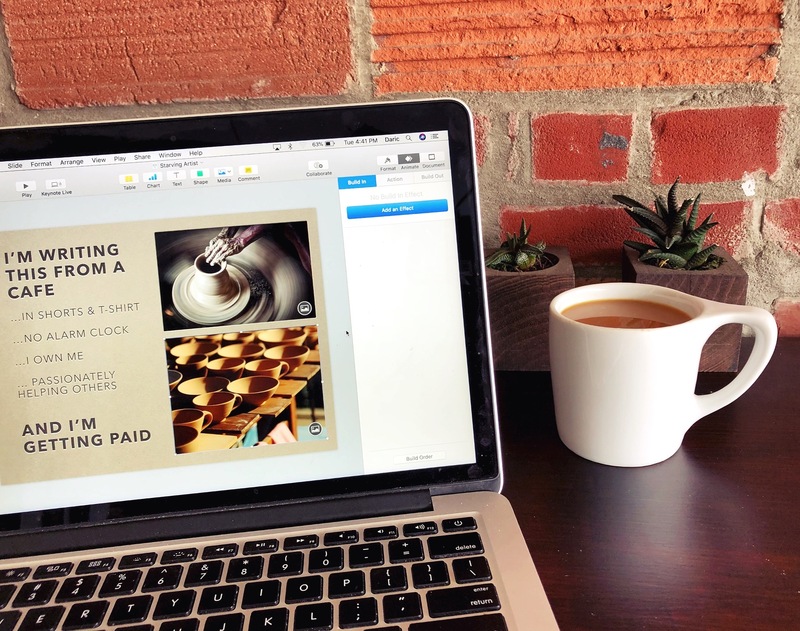 Much like a chapter in The Scènes called A Bohemian Cafe, I am a creative person writing this article from a coffee shop. The parallels seem obvious. But are they really? Unlike the characters in this chapter I didn’t leach off the café, stealing goods and running out other patrons. If anything, the café is aglow with similar self-motivated students and small business people. 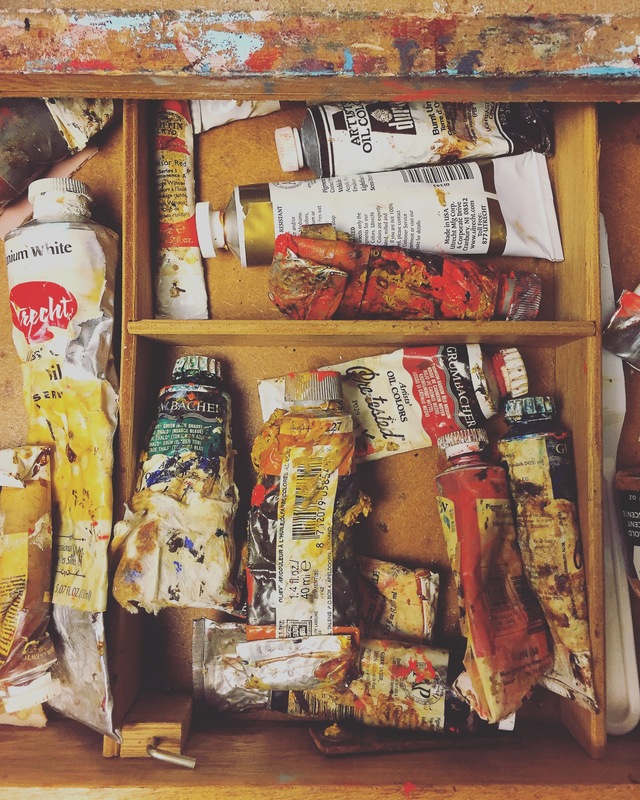 On the contrary, this article is in tandem with a workshop I’m to give later this month– a paid gig contributing towards the professional development of other artists. Hybrid careers are no longer a mysterious force, exclusively reserved for fringe occupations. In America (where I live) there are many opportunities to collaborate with other careers. This trend can be seen globally, where artists often work in tandem with the world’s leading designers, developers, engineers, architects, doctors and more. 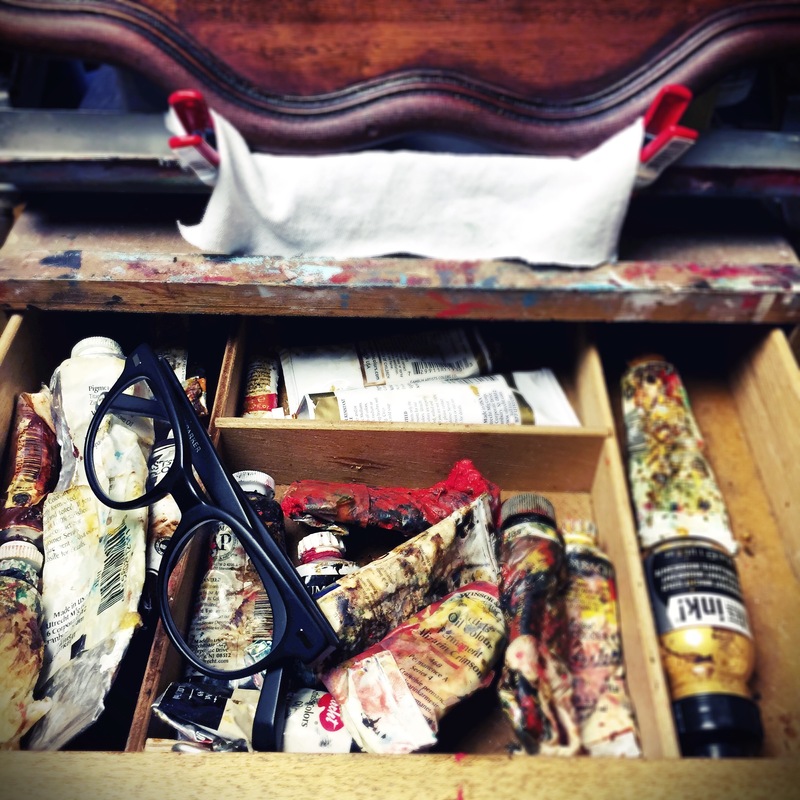 If an artist chooses, their grasp can easily extend past the simple studio life. NOBODY EVER CALLED ME A STARVING PROFESSOR? Ten years ago, I was as much a starving educator as a starving artist. Let this sink in: I made the same in 3 months working as a roofer (the summer I graduated high school) as I did in a whole year as an adjunct professor with a masters degree (8 years later). And to answer your looming question: Yes, I’m tremendously happy with my education because I pursued it not for occupational reasons, but rather because I was interested in learning more about my field. Having said that, my typical class was 3 hours long and lasted 16 weeks. For each course, after taxes my take-home was $1250 FOR 16 WEEKS OF WORK, PAID ON A MONTHLY CYCLE. My course load was often sporadically scheduled with 4 hour gaps between classes and my in-class hours were capped so it didn’t exceed the part-time status. This didn’t include the many hours of grading homework, creating lesson plans for an ever-changing course load, learning new software, meeting with faculty and students, and documenting student work. It’s common for adjuncts to be handed entirely new courses each semester which means they have to learn what they are teaching only days (if not hours) before their classes. That is also time not accounted for. Oh… and NO HEALTH INSURANCE. Yes, 16 weeks worth of work and a required masters degree. I loved teaching, but understandably not the pay. And yet… when I say that I was a college educator, I get an overwhelming amount of respect and admiration. Nobody ever called me a starving professor. Of course, after all of this hybridization of careers, not all artists wear the typical tattered jeans with remnants of clay or paint lingering about. However, as you can imagine, some still do. There are many types of artists and just as many looks. Some may rock anime gear, while others might dress like they’ve been axing down trees in the wilderness. Why is this? There are many reasons why artists can look so weird. Firstly, fashion is an easy way to communicate that we aren’t the same as everyone else. It’s an extension of our personal expression that doesn’t abruptly stop at our artwork. Like any regular job, there’s also a standard of acceptance where you have to look the part. If I go to a formal art gala and I blend too seamlessly into the rest of the patrons, there’s often a sense of confusion and disappointment when I say I’m the artist. So, even when I’m sharply dressed, there’s usually something that helps me stick out. Also, our ‘art-uniform’ is often utilitarian. If you were going to paint your house, you wouldn’t put on your Sunday best. After a while of wearing those close everyday, they become your comfort zone. That’s just what you look like now. And finally, the most overlooked question that explains why we look the way we do…. What would you look like if you didn’t have a dress-code every day for the rest of your life? Even the tiniest quirk in your wardrobe would probably get exaggerated or overused, simply because it can. As you’ve seen, there’s a clear divide in how the average person views our occupation based on how we collectively describe it. Using the phrase “starving artist” is indeed training our society how to view our value in the world. With the breadth of flexible occupations today, you can live an unconventional life as a bohemian railing against establishment without a necessarily poor existence. If you are hustling artwork and still struggling to pay the rent, so are a lot of other people doing totally different jobs. The difference is that most of them don’t live under (and even promote themselves using) the word “starving”. It’s an arbitrary boundary; an invisible limitation that cycles in the direction we are for some reason welcoming. It is a title that tells people that you are charity rather than a business. There’s an outdated disconnect between the artist as a respected creative force and how we as a society view their social and economical contributions. Reversing this paradox won’t happen overnight. It’ll take a long time. As with any social revolution, the upswing starts one person at a time. Being anti-establishment in this case, means taking a stand against our own history of dispositions. It’ll take you finding ways to promote rather than dismantle. Our careers are worthy of ditching the “starving” moniker. Help me be better as I help you be better.